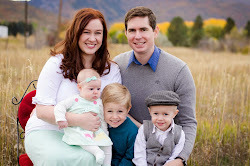 The Ways of the Wayments: Grayson's First Christmas! 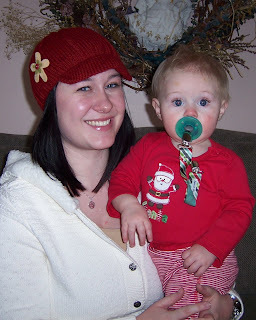 Me and my favorite little baby!!! So sweet! 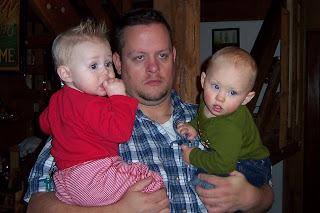 Gray and his Dad sporting their great spikey hair do's! Opening presents with Grandma Jeanne! Gray, Momma, and my favorite new boot slippers! I used to think there was no such thing as a bad picture of Grayson, but lo and behold, he proved me wrong! But it's still so darn cute you can't help but smile!!! Am I wrong?! I just hope this "stink-eye" look doesn't continue into adolescense!!! For some reason, whenever we're at my mom's house, he HAS to climb through her dining room chairs. And he ALWAYS gets stuck. Then he gets frustrated! But he always has to keep doing it! Such a silly boy!!! Big smiles!! So happy it's Christmas!!!!! 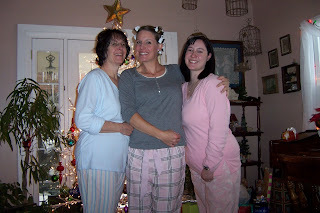 My mom, sister Sarah, and me in our new Christmas Eve jammies!. 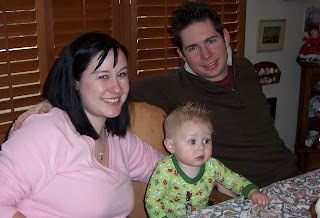 And yes, that is me, being fatter than my pregnant sister. Shut up. Our cute little family at Christmas breakfast! Gray loves being a 'big boy' and sitting in the high chair at the table! what a great Christmas, loving those boots. THanks for the shout out. You are the best as always, oh and if you don't mind, I finally added a picture of Gray on my sweet ruby blog. I may add more later if its ok.
OH my and he is standing? Oh Mantha he is getting so big. Looks like a fun Christmas! Isn't it better with kids??? Grayson is so darling! I love the hat! I also love the funny snowman!!! I still can't get over how beautiful his eyes are! 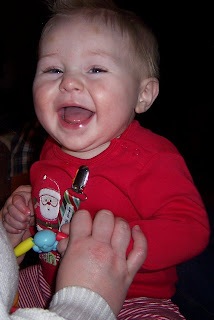 Looks like you had a great Christmas and I'm sure little Grayson got so spoiled! Gray does look so cute in every picture!! Even the funny eye one.